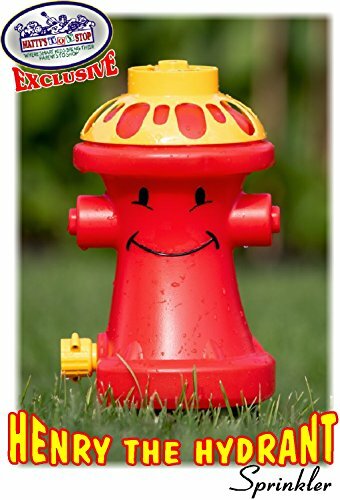 "Henry the Hydrant" Water Sprinkler for Kids is the Ultimate Outdoor Toy for Summer......Perfect to Beat the Summer Heat! 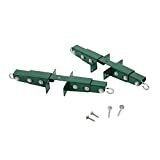 It attaches to any standard garden hose and sprays up to 10 feet high & 16 feet wide! Henry the Hydrant (Fire Hydrant) measures 10.75 inches high and 7 inches wide. It's easy to set up and can be connected with any standard garden hose.....at 10.75 inches tall, it packs a very powerful punch! It spins and sprays water everywhere, so the kids can stand in one place and get soaked or run around and try to avoid getting drenched! Henry is made of heavy duty plastic and will last the test of time....you will feel the difference immediately! The kids will be having the time of their lives in just seconds, with the easy set up. Just attach any standard garden hose, turn on the water......wait for Henry to fill up and your all set to get WET! Makes a great gift & is perfect for any hot day, where a hose is available........such as the beach, schools, party favors, backyard, the lake, promotions and so much more! For Ages 3 and up - Fun for the whole family! - Don't forget that "Henry the Hydrant" is larger than most sprinklers, so give it a minute to fill up before the fun starts! Matty's Toy Stop's "Henry the Hydrant" Water Sprinkler for Kids is the Ultimate Outdoor Toy for Summer......Perfect to Beat the Summer Heat! It attaches to any standard garden hose and sprays up to 10 feet high & 16 feet wide, depending on water pressure! Henry the Hydrant (Fire Hydrant) measures 10.75 inches high and 7 inches wide. It's easy to set up and can be connected with any standard garden hose.....at 10.75 inches tall, it packs a very powerful punch! It spins and sprays water everywhere, so the kids can stand in one place and get soaked or run around and try to avoid getting drenched! Henry is made of heavy duty plastic and will last the test of time....you will feel the difference immediately! 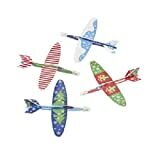 The kids will be having the time of their lives in just seconds, with the easy set up. Just attach any standard garden hose, turn on the water......wait for Henry to fill up and your all set to get WET! Makes a great gift & is perfect for any hot day, where a hose is available........such as the beach, schools, party favors, backyard, the lake, promotions and so much more! For Ages 3 and up - Fun for the whole family! - Don't forget that "Henry the Hydrant" is larger than most sprinklers, so give it a minute to fill up before the fun starts!